The Insight Shop can be found in the upper bath outside the middle door of the base building in the Hunter's Dream and, as its name implies, uses insight as its currency rather than blood echoes. In order for the merchant messengers to appear, you must have at least 1 point of insight. 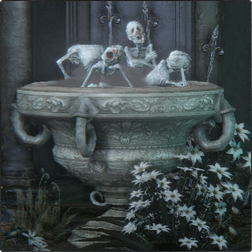 Their inventory includes many items not sold by the Bath Messengers and will expand as you obtain badges, explore Chalice Dungeons and defeat certain enemies. Located outside of workshop on the ledge above the lower Bath Messengers in Hunter's Dream. Patch 1.04 changed requirement for appearing Insight Bath Messengers from 10 to 1 Insight and it's required only once. In version 1.03 it functioned differently. You needed to have always 10 Insight and if your Insight dropped below 10 points during a transaction with them, they would disappear when you closed the shop menu and you needed to increase your insight total to 10 in order to access them again. Gascoigne's Cap 1 Available after defeating Father Gascoigne. Gascoigne's Garb 3 Available after defeating Father Gascoigne. Gascoigne's Gloves 1 Available after defeating Father Gascoigne. Gascoigne's Trousers 1 Available after defeating Father Gascoigne. Grey Wolf Cap 1 Available after defeating Retired Hunter Djura. Ashen Hunter Garb 3 Available after defeating Retired Hunter Djura. Ashen Hunter Gloves 1 Available after defeating Retired Hunter Djura. Ashen Hunter Trousers 1 Available after defeating Retired Hunter Djura. Bone Ash Mask 2 Available after defeating Keeper of the Old Lords. Bone Ash Armor 4 Available after defeating Keeper of the Old Lords. Bone Ash Gauntlets 2 Available after defeating Keeper of the Old Lords. Bone Ash Leggings 2 Available after defeating Keeper of the Old Lords. Henryk's Hunter Cap 1 Available after killing Henryk in the Tomb of Oedon. Henryk's Hunter Garb 3 Available after killing Henryk in the Tomb of Oedon. Henryk's Hunter Gloves 1 Available after killing Henryk in the Tomb of Oedon. Henryk's Hunter Trousers 1 Available after killing Henryk in the Tomb of Oedon. Madman Hood 1 Available after defeating Forgotten Madman. Madman Garb 3 Available after defeating Forgotten Madman. Madman Manchettes 1 Available after defeating Forgotten Madman. Madman Leggings 1 Available after defeating Forgotten Madman. &block; Maria Hunter Cap 3 Available after defeating Lady Maria of the Astral Clocktower. &block; Maria Hunter Garb 5 Available after defeating Lady Maria of the Astral Clocktower. &block; Maria Hunter Gloves 3 Available after defeating Lady Maria of the Astral Clocktower. &block; Maria Hunter Trousers 3 Available after defeating Lady Maria of the Astral Clocktower.